Sprawled across the glowing orange sands of the Sahara Desert and ancient cities, Algeria hums with the rhythmic twang of mandole strings and rugged purr of North Africa. Algeria is the largest country in Africa and home to over 41 million people. 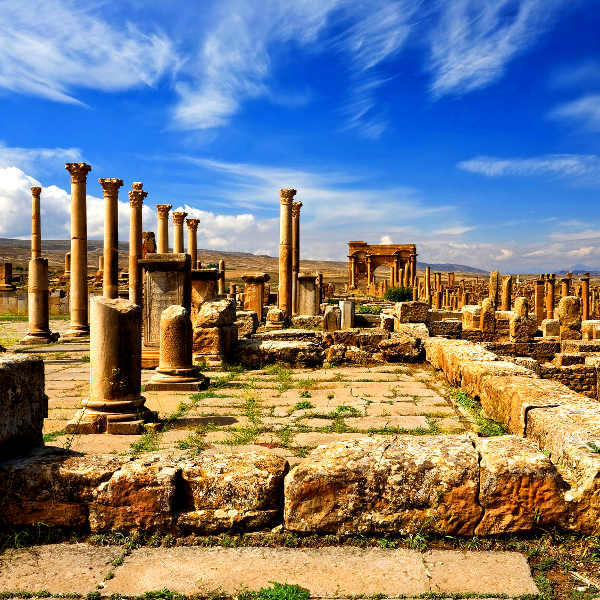 Attractions include the ruins of Timgad in Batna, Ahaggar National Park in Tamanrasset and Algiers. With cheap flights to Algeria you can embark on a holiday that spans mystical deserts and scintillating Mediterranean coastlines. The capital city of Algiers is home to Houari Boumediene Airport (ALG), which is a 35-minute drive from the city centre. Houari Boumediene Airport serves a multitude of airlines, including Qatar Airways, Turkish Airlines and Emirates. Popular connecting flights to Algiers depart from Johannesburg and Cape Town. Flight duration from Johannesburg to Algiers is approximately 15 hours. Algeria is famous for its ancient ruins that whisper of Romans and Berber kingdoms. The city of Timgad and ruins of Qal’a of Beni Hammad are UNESCO World Heritage Sites. The Sahara Desert, which covers 80% of Algeria and bristles with wild mystique and the ethereal hum of nomadic tribes, is one of the most beautiful places in the world. 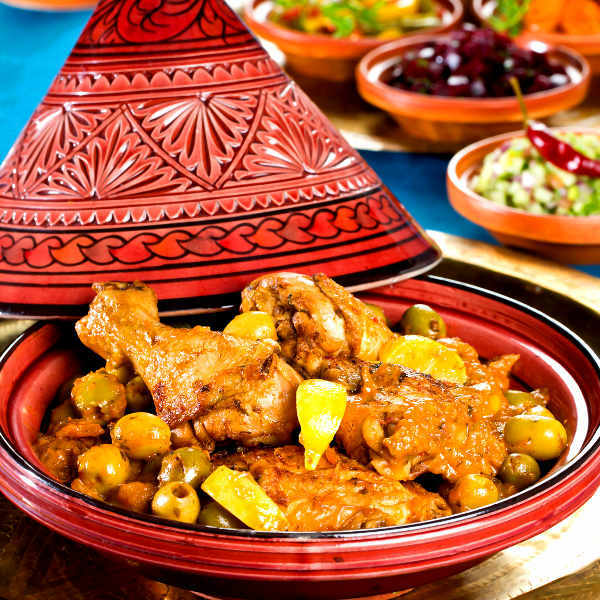 With its Arabic, Mediterranean and Ottoman infusions, Algerian cuisine will tantalise your taste buds and bewitch your senses. Popular dishes include lham lahlou and chakchouka. The climate of Algeria varies from Mediterranean along the coast, rainy and continental in the northern hills and mountains, and blistering in the desert regions. Along the coast, winters are generally mild and rainy, while summers are decadently hot and sunny. The best time to visit Algeria is during spring (March to May) and autumn (September to October), when the weather is balmy and the landscapes are beautiful. If you are planning a desert adventure, the best time to visit is during winter (December to February). Winter is also a great time for skiing. For cheap flights to Algeria, the best time to visit is during winter. Algeria is a place that glows with the fingerprints of ancient civilisations and some of the most alluring cultures in the world. It is famous for ruins that whisper of Roman empires and Berber kingdoms, and cities laced with decadent Arabian architecture and old winding streets. 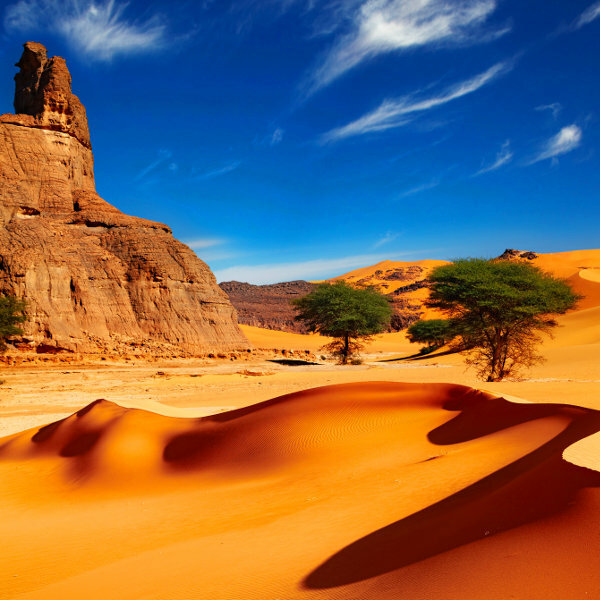 A trip to the Sahara Desert, which covers about 80% of the country, is mandatory. Tassili n’Ajjer is a geological masterpiece and M’zab is a mesmerising traditional 10th century village. Both are UNESCO World Heritage Sites. Ghardaïa and El Oued are pearls of preserved culture and traditions, while Annaba flaunts dreamy beaches and Tlemcen lures history lovers. The city of Algiers lazes on the teal Mediterranean coastline, offering up beautiful mansions, ancient Casbahs, and streets that hum with the deep reverberations of North Africa. Some of the most notable Roman ruins include: Khemissa, Tipaza, Lambaesis, Tiddis and Djemila. Some of these boast perfectly preserved Byzantine churches, temples and walls adorned with mosaics. The city of Constantine is also a must see. Compare several airlines and book your cheap flights to Algeria online at Travelstart! South African passport holders require a visa to enter Algeria. You will need to ensure your passport is valid for at least six months and has three blank pages for entry stamps. The Algerian Embassy is situated in Pretoria. There are certain risks when travelling to Algeria. Research should be done beforehand on which areas to avoid, and it is recommended that you stay up to date with travel advisories and the security situation. Travel insurance to cover theft and medical expenses is also recommended. Avoid all travel to the areas bordering Libya, Mauritania, Niger, Tunisia and Mali. Remain vigilant in crowded areas and only make use of licensed and reputable taxis. Avoid travelling alone at night (especially women) and steer clear of large gatherings and public demonstrations. Leave your valuables in the hotel safe, as pick-pocketing and robberies do happen. It is important to familiarise yourself with the local laws and customs before arriving. Proof of yellow fever vaccination is required if you are travelling from an infected area. Although the risk of malaria is low, you should still take precautions to avoid mosquito bites. Precautions should also be taken to avoid Middle East Respiratory Syndrome Coronavirus. Immunisation against hepatitis A & B, typhoid and rabies is recommended. Other recommended vaccinations include MMR, diphtheria-tetanus-pertussis, varicella and polio. Stick to bottled water.